What is Unikat Polish Pottery? In Polish, the word for unique is Unikat. Often, our customers will navigate through the website and then find a piece that is marked as Unikat, which is located on the bottom of the Polish pottery piece. This is where the manufacturer will normally stamp their logo. The manufacturer logo stamp will indicate that the pottery piece is hand made in Poland. The Unikat pattern may or may not have the artist signature on the bottom, but a Unikat piece will always be stamped with “UNIKAT” on the Polish pottery. Distinctively designed, Unikat pottery has sophisticated details that define the pattern’s own uniqueness. This distinguishes each Polish pottery piece as an individual to its counterparts. No piece of Polish pottery will ever be exactly the same. 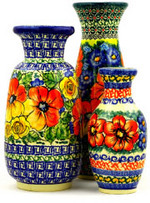 Our Polish pottery is hand-made and hand-painted. Therefore, all pieces are personalized by an artist and are all very special and unique in their own pattern design. However, a Unikat piece is hand-made and hand-painted by an exceptionally skilled artist. Unikat artists immerse themselves in intense training and have spent years practicing their own techniques to individualize the definitive Unikat patterns. A Unikat Polish pottery piece is remarkably breathtaking, considering the time and effort that an artist takes to make the piece. Using a variety of six to eight paint colors and including fine details, each one is unique. Popular with collectors of Polish pottery, Unikat pieces are normally purchased as display items. However, as the popularity of these unique designs is slowly expanding, more than just collectors are now purchasing the pieces. This entry was posted in Buy Polish Pottery online and tagged Boleslawiec, Ceramika Artystyczna, Polish pottery, Polish stoneware, UNIKAT on November 6, 2012 by melissa.